1. I have a confession. These days, if something is on sale & it fits me, I buy 2-3 of them in different colors. A month or so ago, I bought 3 boat neck tees for $8 at Old Navy. One of them is a solid white and the other two are striped. 2. If you know me at all, you know that I do not purchase or wear pink. But this tee was an exception because it fit and it was only $8 for crying out loud. However, if I was going to wear pink I needed to find a way to make it more...me. 3. I love pattern mixing. If it is done well ((which so often I'm sad to say it is NOT done well. )), it can be used to create a look that is uniquely you. These three random facts led me to today's DIY. Enjoy! 1. Pick an underutilized striped (or solid) tee from your closet. 3. Cut out two ((identical)) pocket shapes. I just eyeballed it. 4. Sew around the edges of your pocket, but don't sew up the top. 5. Flip your pocket right side out and press/iron it nice & flat. Right before you press, fold in the top so the raw edge isn't exposed. 6. Sew two lines ((to make it look all profesh and stuff)) at the top to secure the edges and to make it look like a finished pocket. 7. 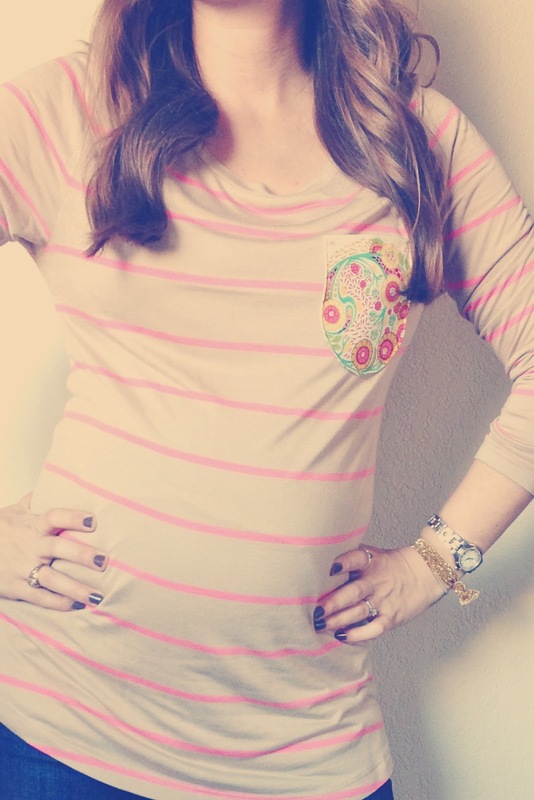 Try on your top and figure out where you want your pocket to be placed. Pin in place. 8. Sew very close to the edge of the pocket all the way around. 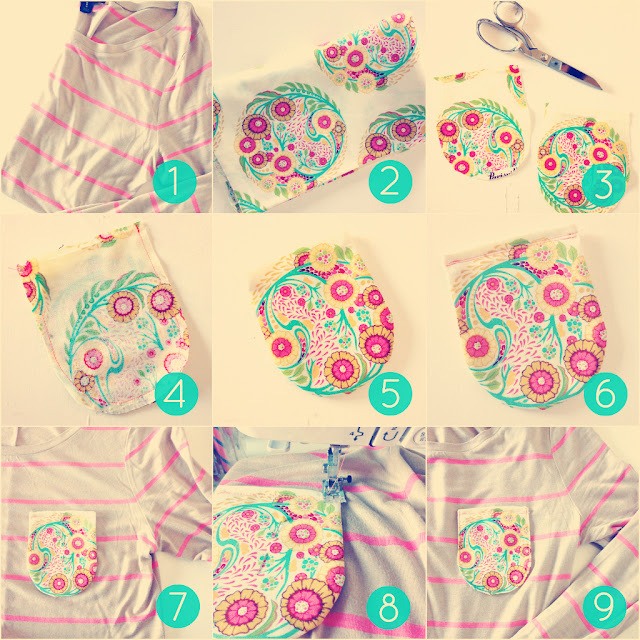 Make sure to only sew the top of your tee and not through both layers. 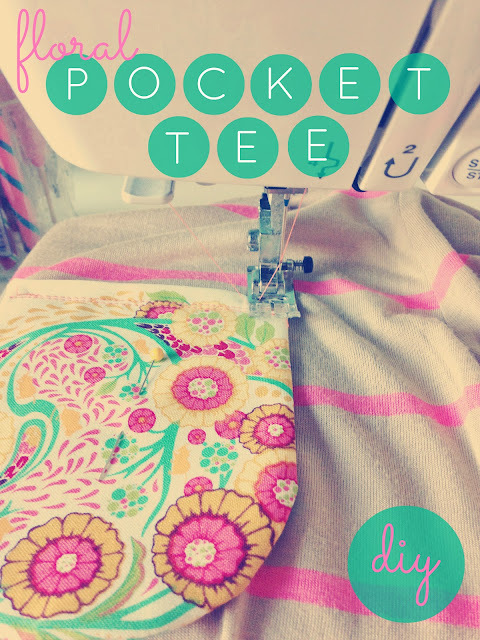 Make a tiiiiny little pocket! Have fun mixing OTHER prints. Have a floral top you haven't worn? Add a polka dot pocket!! Make the inside of your pocket a solid color. Make the whole pocket a solid color. The possibilities are limited only to your imagination, friends. Pretty cute. Thanks for sharing. Id love to try that someday. Great idea and yours turned out great. How are you feeling these days? 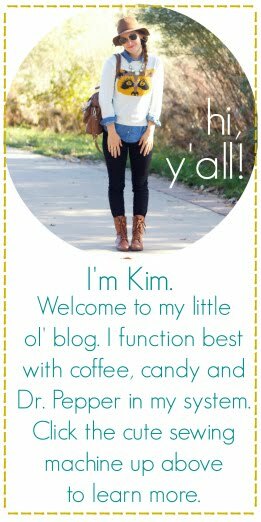 I love this, Kim!! I need to dust off my machine too - ACK! This is seriously so adorable! I totally agree with you about pattern mixing. One of the reasons I love your outfit posts so much is because you do that so well! so cute! i'm definitely doing this to a tshirt i hardly ever wear. plus, elbow patches in the same fabric would be adorable! I love this!!! Such a fun idea! this is absolutely darling. i feel like even i could accomplish this with my limited sewing skills. and you are the tiniest pregnant gal i've ever seen! so cute! I hear you on buying multiples of the same shirt. I kinda wish I did that more often, and then added elements like you've done to make them different! SO cute & what a steal! Awesome DIY, I've got a few pieces I can do this with! This is such a wonderful idea!! Wish I were that creative. So clever and pretty! LOVE!